“Uyghurs are not terrorists. Don’t treat us like we are aliens. It’s funny that China always says 56 ethnics are one big family, but they treat Uyghurs and Tibetans like we are some kind of animals.” — Fiona (pseudonym), an Uyghur living abroad. Xinjiang. This lesser-known northwestern natural resource-rich province of China borders 8 countries: Mongolia, Russia, Kazakhstan, Kyrgyzstan, Tajikistan, Afghanistan, Pakistan and India. Within China, it shares a border with the Tibet Autonomous Region and the provinces of Gansu and Qinghai. Although China is typically thought of as having an ethnically homogenous population, there are 56 ethnic minorities residing within its borders. In Xinjiang, the two largest ethnic groups are Uyghurs, a Turkic majority-Muslim ethnic minority, and Han, the ethnic majority of China. If you type “Uyghur” into Google search, you will come across articles that discuss rising tensions between Uyghurs and Han (the ethnic majority which composes about 92% of China’s population). The Chinese government has generally attempted to maintain a narrative that portrays China as a unified nation of harmony where Han and ethnic minorities alike have always been a part of the Chinese nation. However, for many Uyghurs, as well as Tibetans and others, the state’s assertion of a catch-all Chinese nationalist identity is an inaccurate alternative history at best, and at worst, a completely malicious attempt to rewrite the past in attempts to justify what could be, according to some, a colonialist project. Those who push back against the Chinese government’s term “Xinjiang” may refer to the region as East Turkistan instead. Aside from being rich in natural resources, Xinjiang holds economic importance in other ways: China is currently implementing its ‘Belt and Road Initiative’; a project that has been characterized as a “21st century Silk Road” that will go through Xinjiang and cut through more than 60 countries. With so much at stake economically-speaking, China understands that it must continue to solidify its control over Xinjiang by not only maintaining a physical presence but also by changing the cultures, languages and societies of the region from within. Additionally, Xi Jinping’s recent solidification of power will most certainly not help the situation any. If the logic behind the portrayal of Xinjiang as an integral part of China sounds familiar, that’s because it has been used before but in a different context. While the cases of Algeria and Xinjiang are quite different, interesting parallels exist between the colonization of Algeria by France and the current situation in Xinjiang. An individual of minority ethnic background living in Xinjiang that I have remained in contact with remarked on the numerous similarities between France and China as viewed through the lens of colonialism. This is a topic that would need to be addressed separately but is worth briefly mentioning here. French journalist, Ursula Gauthier, wrote a response article condemning China’s brutal oppression of Uyghurs and she criticized the government for attempting to draw parallels between terrorism in France and terrorism in China. China refused to renew her credentials and she was ‘expelled’ from the country for this report. Just this past July 2018, China also revoked the credentials of BuzzFeed News American correspondent, Megha Rajagopalan, because of her work on human rights issues; Xinjiang being among one of the topics that she has covered. 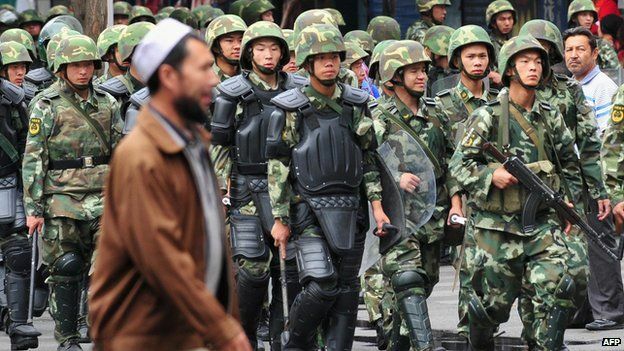 In July, 2009, tensions in Urumqi, the capital, erupted in the form of a riot. The Chinese government blamed the violence on exiled Uyghur leader, Rebiya Kadeer, and her organization, the World Uyghur Congress, with claims that they had phone records to prove that she orchestrated it from abroad while in exile. The World Uyghur Congress, however, asserted that the initially peaceful protests were in response to the government’s “inaction after a deadly attack on Uyghur factory workers in Guangdong province…” In the past, China cut off international journalists’ access to Tibet and Xinjiang when conflicts arose. This time, however, they allowed journalists access to Urumqi with minders monitoring their every move to ensure that only state-approved reporting of the riots would make international news. Conflicting testimonies concerning the riots and the death toll remain but government restrictions mean that finding the facts of the incident are difficult. Unsurprisingly, the government swiftly cut off internet access, blocked any in-coming calls to Xinjiang and took down Twitter nation-wide. For a year, the only accessible TV channel in the entire region was a state sponsored channel. My Uyghur friend, who left for study abroad shortly after, was unable to call her mother for an entire year due to the year-long complete black-out. One thing is undeniably true: the tensions are there and they have significantly worsened. In September 2017, reports arose of officials placing a ban on Qur’ans, sajdahs, hijabs and “abnormal beards”. And now, there exists an ever-increasing number of testimonies from Uyghurs, and also other ethnic minorities, of being forced into re-education camps for supposed extremist views or anything that could be interpreted as anti-government. Some people are released within months while others are being held indefinitely. Additionally, there have been reports of Uyghurs dying while in detention. China largely denies that such camps exist but mounting evidence that human rights violations have taken and continue to take place indicate otherwise. Reports by the Guardian and Foreign Policy estimate that 800,000 incarcerated individuals, who are mostly Uyghur, have been detained in these re-education camps. Radio Free Asia places the estimate even higher at three million people; an estimate that includes not only those currently being detained but also people who have attended re-education camps part-time. Canadian law student, Shawn Zhang, used Chinese government tender notices which were once available online and google maps to locate many of these re-education camps with a high degree of confidence that these were, in fact, the detention centers that he had heard about on the news. Despite testimonies and increasing evidence concerning the existence of these camps, China continued its denial at the UN Committee on the Elimination of Racial Discrimination which recently convened in Geneva on August 13, 2018. Global Times, a pro-Chinese government tabloid, published an op-ed piece blaming “the West” and “radical Western forces” for instability in Xinjiang and portrayed the Chinese government as saving the region from “turmoil” while promoting concepts of ethnic harmony: “The security situation in Xinjiang has been turned around recently and terror threats spreading from there to other provinces of China are also being eliminated. Peaceful and stable life has been witnessed again in all of Xinjiang. A report by the Chinese Human Rights Defenders (CHRD) however, indicates that arrests in Xinjiang “account for 21% of arrests in all of China” in 2017. Despite government denials, these statistics indicate, at the very least, that arrests on a mass scale are occurring in the region. Those in Xinjiang who are not detained are not free either. Restrictive security measures are being implemented through the means of facial recognition scanners, DNA/biometrics collection of Uyghurs for registration purposes, in what would be fair to refer to as a Muslim registry, frequent checkpoints and other forms of electronic surveillance such as making individuals download a government surveillance app into their phones or requiring them to use a QR-coded knife despite it being a common household item. All of this is done in the name of defeating what the Chinese government refers to as the Three Evils of Terrorism, Separatism and Extremism. Daily discrimination against Uyghurs results in an almost de-facto segregation between Han populations and Uyghurs in many cities and Uyghurs are frequently turned away from business establishments because of their ethnicity. Uyghurs studying or working abroad are still within the grasp of the government because of the constant ever-looming threat that their families back home could be detained at a moment’s notice and taken to one of the re-education camps or put in prison if they do something that the government doesn’t like. I saw how that fear affected Uyghurs living here in my country (a Western country): I was talking to Uyghur employees at a Uyghur restaurant and we were having a normal conversation. Gradually, the conversation became more political in nature but we still kept it vague by only implying certain things without stating them directly. Before I left, one of the employees told me that he wished could say more but had to be careful because there was the possibility of the wrong person overhearing our conversation. This conversation happened a while ago when things were not nearly as bad as they are now. Kazakhs have also been targeted by the government and sent to these camps. On May 18, 2018, The Independent wrote an article about a Kazakh citizen who had been detained in one of the re-education camps and what he experienced there. While Han Chinese citizens living outside of Xinjiang are generally not as directly affected, the region is a testing ground for repressive policies and surveillance tactics that very well may be implemented in other areas of China. Project Coordinator at the Uyghur Human Rights Project, Nicole Morgret, said, “"The question a lot of people have [is] ... to what extent is this going to be rolled [out] across the rest of China and packaged and sold to other repressive governments around the world?" Uyghurs clearly bear the brunt of the repression but restrictive policies are also used to monitor foreign journalists, academics and tourists. A Chinese-American friend, Yujin (pseudonym), recently visited multiple cities in Xinjiang over a two-week period and what she experienced was unnerving. Quite often, she would have to stop at checkpoints (up to 6 times in a single day) where the police would photograph her passport, take a picture of her face and, in certain encounters, finger print her and her family. Yujin’s Han Chinese appearance probably helped her to some degree, but she was still regarded with suspicion as a foreigner, and more specifically, as an American traveling through Xinjiang. Her experience is not unique. Foreign tourists are now restricted from entering certain cities and are often interrogated. Government attempts to strictly control the flow of people and information coming in and out of the region are only intensifying. “I was born in Urumqi, Xinjiang. It was a beautiful and peaceful city. People are loving. Until I went to Junior high, I didn’t know what it was like to be different. Uyghur is different from Han. We have different languages and cultures, and we believe in Allah. In Xinjiang you couldn’t find a restaurant without Halal sign. Han people in Xinjiang also respected us. I don’t remember since when Chinese government changed everything. We are not allowed to learn our own languages, not allowed to celebrate Eids, not allowed to talk to people who live in other countries. When I first came to the U.S. it was all good. The past two years, Uyghurs who live in Xinjiang are not allowed to have a passport. I live here by myself, my whole family is in Xinjiang. I’m worried that Chinese government will put my family in a hard place because of me living here for long time. Because Chinese government wants to control every single Uyghur, they don’t want us to live in a country where you can speak for your own voice. I know it’s not realistic but I wish someday Chinese governments can hear our voice. Uyghurs are not terrorists. Don’t treat us like we are aliens. It’s funny that China always says 56 ethnics are one big family, but they treat Uyghurs and Tibetans like we are some kind of animals. We don’t need hundreds of security cameras in every single block, we don’t want to be searched on every single area, and we want to celebrate our festivals like Hans celebrate their new year. Centering Uyghur, Tibetan, Kazakh, Uzbek, Hui and other persecuted groups’ voices is crucial, but the risks are high for not only the individuals themselves, but also for their families and everyone else they know. Fortunately, the human rights atrocities committed in Xinjiang are gaining more publicity thanks to individuals in Xinjiang who talking about their experiences on or off-record, human rights workers and journalists across all nationalities who are working to get the word out. Ideally, other countries should pressure China but its status as an economic powerhouse make that task more difficult because other governments are diplomatically hesitant to engage China on human rights matters. Issues pertaining to Xinjiang are far from simple but it is not biased to recognize or acknowledge that Uyghurs, other ethnic minorities and ethnic Han dissidents, face horrifying wide-spread systemic abuse perpetrated by the government of the People’s Republic of China. Censorship and surveillance is present in other areas of China but Xinjiang serves as a real-world example of what is possible when full surveillance, aided by advanced technological measures, is heavily applied. Perhaps the most helpful thing that we outsiders can do is raise awareness of Uyghurs and China’s re-education camps. Although a number of first-hand accounts from Uyghurs have made it into the news, thousands upon thousands more have no choice but to remain silent; trapped in the shadow of the Chinese government. Editor’s Note: This article was written at the end of September 2018 and a lot of new information about Xinjiang and the oppression of Uyhur Muslims has been produced since then. The author, who writes under a pseudonym, will continue to publish pieces on this topic in the coming months. Please continue to check the Ruman Project journal for more information. Join Our Second Annual #ThankfulForMuslimWomen Campaign!